With its future program TOGETHER – Strategy 2025, the Volkswagen Group has launched the biggest change process in its history, laying the foundations for lasting success in tomorrow’s world of mobility and for its evolution into a globally leading provider of sustainable mobility. The automotive world is in a state of transformation, and autonomous driving, e-mobility and connected vehicle concepts are the dominant trends. Technological changes are influencing customer needs and business models; new competitors are entering the market from other industries; shorter innovation cycles and the establishment of new core competencies require ever more capital; stricter emission standards and increased market volatility lead to more complex underlying conditions. All this poses new challenges for us as a vehicle manufacturer. the vision of becoming one of the world’s leading providers of sustainable mobility. With the future program, we are making the Volkswagen Group more focused, efficient, innovative, customer-oriented and sustainable, and more systematically geared to generating profitable growth. Experts from all parts of the Company worked on developing TOGETHER – Strategy 2025, which builds on the successful Strategy 2018. 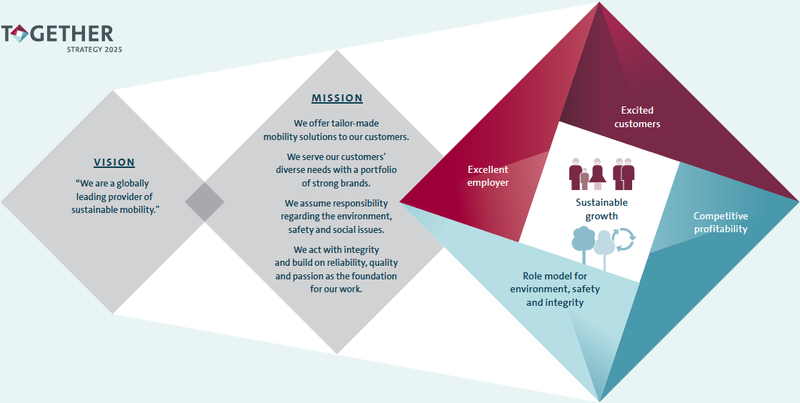 The strategy arose at the core of the Company and unites the knowledge, experience and vision of the Company and its employees. The time horizon until 2025, which features in the strategy’s name, stands for long-term, future-oriented thought and action. The term TOGETHER describes the mindset that will be even more vital to the Volkswagen Group’s long-term success going forward. Our intention with the new Group strategy is for everyone in the Volkswagen Group to join us in producing fascinating vehicles and forward-looking, tailor-made mobility solutions that will continue to inspire our customers, meeting their diverse needs with a portfolio of strong brands. Every day, we actively assume and exercise responsibility in relation to the environment, society and safety, and we wish to be a role model in these areas. Integrity, reliability, quality and passion form the basis for our work. The realignment will enable us to maintain our technological leadership in the industry and at the same time ensure our competitive profitability. Volkswagen will thus remain an attractive investment and, what is more, an excellent, reliable and secure employer. TOGETHER – Strategy 2025 creates the framework and lays the building blocks for the evolution of the Group, with its strong brands, its international production sites and its skilled, dedicated workforce. The Code of Collaboration formulated as part of the future program is the foundation on which the Group strategy rests. The Code describes how collaboration is to take place within the Group and between individuals in their day-to-day work. Its core values are encapsulated in the terms “open and honest”, “uncomplicated”, “without prejudice”, “on an equal footing” and “for one another”. The change process is complemented by the corresponding strategies of the brands and functional areas.